It's no exaggeration to say that most cases of sudden hair loss are caused by poisoning. 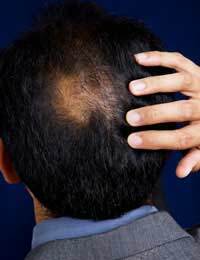 In some cases this is a secondary symptom of stress or illness causing the body to malfunction and poison its own hair follicles. It other cases, however, it is an early warning that you've eaten, drunk or breathed something dangerous. Prompt medical action when sudden hair loss occurs could save you from the more dangerous effects of poisoning. Most of us are aware of the adverts that warn us to be careful about carbon monoxide in our cars and homes. You'll have heard stories of people breathing it in whilst asleep and never waking up. But sometimes the reality is less dramatic. A slow carbon monoxide leak may not kill you immediately but will make you more and more ill. When the body starts to take in too much carbon monoxide on a frequent basis, hair begins to thin. Hair loss is usually evenly spread and it can take place over a couple of weeks. Over this time, bald patches will start to appear, especially near the crown and in places where styling puts the hair under stress. The good news is that after the poison is gone, healthy hair will usually start to grow back within two weeks. Warfarin is a poison frequently used for killing rats. It's also used in small amounts to treat heart problems. Because of this, it's fairly common for people to accidentally poison themselves with it. In small quantities it thins the hair where follicles are weak, mimicking the effects of age even in children. In larger quantities it makes the hair fall out dramatically. In cases of warfarin poisoning, follicles can simply lose their grip on the hair. It tends to come out overnight, due to friction with pillows, or it comes out when combed. If the poisoned person recovers, hair can grow back but may not be as thick as before. You may not think that you come into contact with much mercury in the course of your life, but the chances are that you do, and it can easily be toxic. Mercury builds up in the bodies of fish, especially those at the top of the marine food chain like tuna, anchovies and swordfish. Most people consume it this way. It is also present in some medicines, and mercury leaks into the household water supply have been known. Occasionally it is found in high levels in hair bleach. Mercury poisoning causes thinning of the hair, often in patches. Alongside this, the sufferer will usually feel disorientated and confused. If you suspect mercury poisoning, save some of the lost hair to give to your doctor, who will be able to test it to find out. Unfortunately, though it can be possible to treat some of the symptoms of this affliction, mercury takes a long time to flush from the body so hair will recover only slowly, if at all. Lead - Can cause learning difficulties in children, headaches, tiredness and pallor. Hair loss is usually slight but noticeable. Copper - Causes anaemia and weakening of hair follicles so that hair easily come out under stress. Quick treatment can mean full recovery. Aluminium - Causes hair to acquire a greenish tint before thinning dramatically and falling out in clumps. Confusion and nausea are other early symptoms. Lithium - Can cause significant thinning of the hair. If you take lithium on prescription for a mood disorder, report hair loss quickly as it could mean your dose is too high. Bismuth - Can cause hair to come out in clumps. Urinary problems are also common. If you're taking stomach or nausea medication, tell your doctor about these symptoms immediately. For many centuries arsenic was used to thicken the hair, making it grow black and wiry. Too much, however, is very dangerous and can also cause hair to fall out. Because arsenic stays in the body over time, low doses gradually add up to high ones. Hair loss caused by arsenic is usually gradual and accompanied by nausea and confusion. We may think of poisons as an old fashioned problem from when understanding of chemistry was more limited, but many are common in the modern domestic environment. Watching out for these symptoms and taking sudden hair loss seriously could save your life. How can these poisons be introduced to a subject? Correct me if I'm wrong, but for most of us the chances of most of us taking in enough of any of these substances to cause hair loss is pretty minimal. Also, wouldn't these poisons have an effect on the whole body, not just the hair - that is, the hair loss would be a symptom of the poisoning, which would be causing real health problems? Would the hair loss be a way to identify the poisoning? It's an interesting article, but I'd be curious to know how many instances of this occur each year, at least in the Western world.